Cobra Electronics is a leading global manufacturer of mobile communications products for consumers, having attained a leadership position in every market in which it currently does business. Cobra has a track record of designing innovative and award-winning products.PRODUCT FEATURES:Stylized Design - reflecting the trends in new vehicle designs, sculpted features and muted graphics, which give it a dynamic look that will compliment any of today's vehicles;Compact Design - easily installed into most cars and trucks;Illuminated LCD Display - allows high visibility of display;RF Gain - adjusts receiver sensitivity to match incoming signal; allows you to decrease sensitivity for strong signals and increase sensitivity for weak ones;Electronic Tuning - precisely tunes all 40 CB channels;Instant Channel 9/19 - instant access from any channel to Emergency Channel 9 and Information Channel 19;Combination S/RF Meter - indicates incoming signal strength and output RF power output;CB/PA Switch - selects CB operation or public address (PA) operation for communication outside of the vehicle with PA horn (not supplied);4 Pin Screw-On Mic Connector - convenient removal of mic for storage and easy reach from anywhere inside the vehicle;Heavy-Duty Dynamic Microphone with 9 Foot Cord - contoured microphone with dynamic voice response circuitry;Power On/Off and volume control;Squelch Control - eliminates background noise in the absence of a signal. I had this radio in my Dodge truck. It tucked nice under the dash and was a great performer. Power was good as well as reception. Great Buy! Any CB you purchase is limited to 4 watts output power so dont let size fool you. ALL CB'S are limited to 4 watts due to FCC regulations, look it up! The price on this site is high retail to say the least. I purchased this unit from Wal-Mart for 35 dollars. Small radio with lots of annoyances. 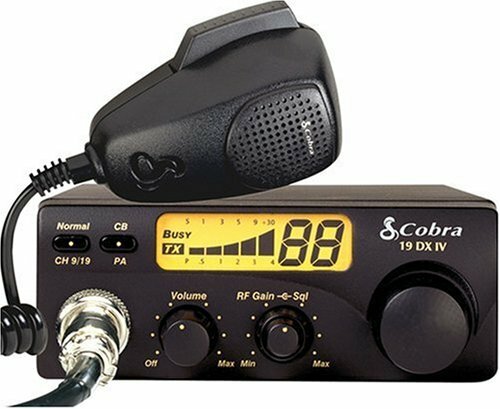 I bought the Cobra 19 DX IV for my wife's car since we needed a small radio without bells and whistles. 1. Unit resets to channel 01 when it loses power. So either wire it directly to the battery (and remember to turn it off!) or wire it to accessory power and work channel 01 every time you start the car. 2. "Poppy" squelch. When a weak signal breaks the squelch then fades, the squelch makes an annoying popping sound as it squelches the audio. 3. S/RF meter shows nothing (drops to zero) when squelch activates. If the squelch is set fairly high, the meter shows no signal until someone manages to break the squelch. I personally think the meter should show all RF activity whether the squelch is on or off. It's a decent unit, and cobra is a great company, but there is much better. The midland 1001z is much better built and has much better sound quality and features. That being said, here's why this radio gets three stars. My main issue is the new digital setup on this radio. It pops as signals come in and out of the squelch range. This gets very annoying when you want to just cut out the white noise and hear as much as you can. If someone is right on the border of your signal range, they will pop as they cut in and out, where as other radios will feather in and out, or hold the signal until they quit transmitting. The previous generation of this radio (with the separate LED lights for the meter) was MUCH better in this regard. If you must have a cobra, look for that version, or go to another model. Cobra just went too cheap on this one, but you still pay a premium for the name. All the components feel needlessly light compared to the competition, and also compared to older cobra's themselves. The one missing feature that others have is the RF gain. Very handy and doesn't seem like it'd be much trouble for them to add it, but they reserve that for their expensive radios.